Friday night: Mainly cloudy. Patchy fog. Low to mid 40s. Saturday: Gray start. Some afternoon brightening. 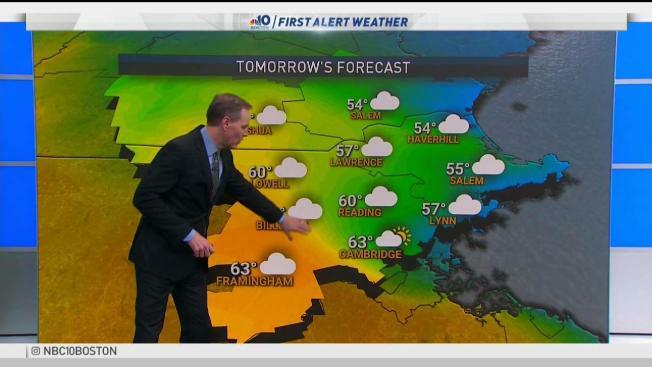 50s north, low 60s south of the Mass. Pike. NE wind turns SW late. Sunday: Mild with a few peeks of AM sun. Afternoon clouds and showers. Low to mid 60s fall to the upper 40s by evening. Wind shifts to the northwest. This weekend is bringing a shot of mild air for many in New England, though the goods will not be distributed evenly across the six-state region. An upper-level atmospheric disturbance Friday delivers periodic showers to most of New England, excepting the Cape and far southeast Massachusetts, where showers should remain to the north and a mostly cloudy but dry day is expected. Of course, the showers will help to knock down the pollen count, which has been rising particularly with the introduction of maple pollen this week. It will concurrently decrease the moderate fire danger that contributed to Thursday’s Fenway brush fire in the reeds along the Muddy River. Nonetheless, even showers aren’t stopping the move of milder air. This air is being transported into New England on a southerly wind and delivers daytime highs in the 50s for many on Friday and a relatively mild night Friday night. Showers Friday night will shift northward, focused mostly on the northern half of New England, where a light mix of rain and freezing rain will create some slick spots into Saturday morning. Though most of Saturday is expected to be dry, save for some showers in the mountains, not everyone will be equally mild. A southerly wind will deliver highs in the 60s with breaks of sun to much of southern New England. However, it may take more than half the day to get warmth to far northeast Massachusetts. That warmth may never reach the New Hampshire seacoast points north and east. A passing cold front will deliver a period of rain from west to east, starting Sunday morning to midday, respectively, and wrapping up Sunday afternoon to early evening. Behind the cold front, a fresh shot of cool, dry and bright weather will start next week before a chance of showers at the midweek and week’s end in the exclusive First Alert 10-day forecast.